The Billie Joe Armstrong Signature Les Paul Junior is an apparently accurate reproduction of theÂ Green DayÂ front-manâ€™s original 1956 LP Junior affectionately known as â€œFloyd”. 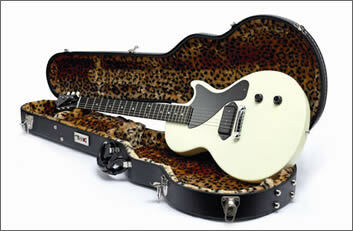 Designed in close co-operation with Billie Joe, it featuresÂ a mahogany body and neck with nickel hardware. The Billie Joe Armstrong Les Paul Junior combines the best features of a vintage Junior with some modern twists.Â With a new special design stacked double-coil H-90 and a vintage style non-compensated wraparound tailpiece, the Billie Joe Armstrong is a ferocious, resonant rock â€™nâ€™ roll guitar, truly worthy of Billie Joeâ€™s name.